A major leak for Forza Horizon 4 has revealed the racer will likely feature a level inspired by Halo: Combat Evolved's Silent Cartographer Mission. The leak, which came in the form of a huge image-dump on Imgur (via Eurogamer), included an image of Halo’s iconic Warthog all-terrain vehicle sliding around a beach, while a segment of Halo’s vast ringworld arcs into the sky in the background. 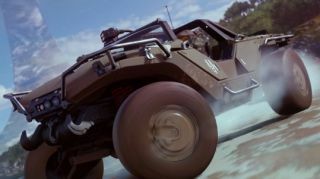 Halo’s Warthog has featured in Forza Horizon before. With a little bit of work, players could unlock the vehicle in Forza Horizon 3. However, this would mark the first time the series has offered a full-blown Halo event. There’s further evidence to suggest this will be a more substantial Halo-themed offering. In July, fans spotted an icon on a beach on the Forza Horizon 4 map that resembled a Pelican dropship. Meanwhile, in June a bunch of people downloaded the game several months early, and a subsequent data-mine of the content revealed Halo-files. The image of the game, alongside the location of the map’s icon, both suggest that the event will be themed around the original Halo’s “Silent Cartographer” mission, since it predominantly featured both a coastline and player use of the Warthog. The leak also included dozens of other images of Forza Horizon 4. Many of these were model renders of vehicles featured in the game, such as a London taxi, a Volkswagon camper van, and a 1960s Mini Cooper. In addition, it revealed several classes of vehicle that we’ll see in Playground Games’ grand tour of the UK, such as vintage cars, collections from the 60s and 70, and, er, trucks. We’ll find out the full extent of this Halo-themed event when the game launches on the 2nd of October.